Hey! Today I completed my second 5k run (3.1 miles) and it was a blast! My first run was the Color Run a while back, and today I did the Bubble Run in Pomona, CA. I have a sinus infection and I am sore from a bootcamp two days ago but we did it! This was the perfect run for first timers, or those who are experienced runners! The entire thing was smooth sailing and it was extremely cost effective. So grab your bubble gun and read on! This 5k held by Cool Events was actually free if you registered in time. You did have to donate $1 to charity and purchase insurance so it was actually $11. On the website you can create a team name and choose your shirt sizes. The packages came with headbands, temporary tattoos, a race number and safety pins. I came the evening before the race to pick up our packets. That saved us a $5 convenience charge, and it saved us about 30 minutes on the day of the event. Highly recommend picking up your items early! 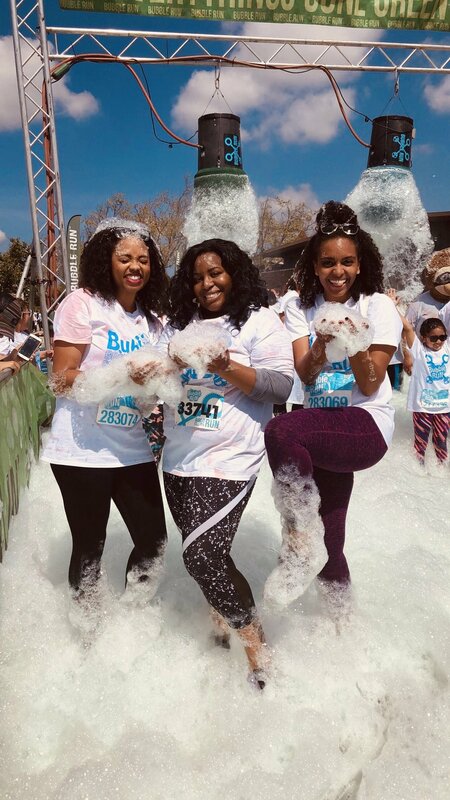 The Bubble Run was held at the Pomona Fairplex and SO many people were there. It was super family friendly. They had 3 different colored bubble stations - pink, green and blue. We walked most of it, but ran parts of it as well. I’m literally sore already. The run was mostly paved, with part of it on an old horse track. The pink bubble station was my favorite. Each bubble station had a different kind of music as well, so we definitely danced while we ran! Also, the bubbles kind of sting when they get in your eyes so some little kids had goggles on. Thankfully, the weather was amazing for a 5k run in California. As grad school comes to an end, other things have ended too. My relationships + friendships have changed and life has altered. I have been creating boundaries between myself and things around me, which is hard but necessary. Lately, I am seriously adjusting to new things. Taking the time to step outside of my house and go into the elements was very refreshing. Today I felt like myself again - goofy, loud and free. My shoes were squishy with bubble water and my legs aching from running and I was just smiling. I feel like as grad school ends, a new chapter is beginning. I think everyone should experience a 5k or physically focused activity to just get out of your head. Going out for lunch, a movie or drinks is always fun. But there is something different when you connect your emotional state to your physical body. I enjoyed it a lot and my sister and I are already looking for another one to do! Have you run a 5k? Leave a comment!